Friday's woeful results could be one of the last public earnings reports from BlackBerry. 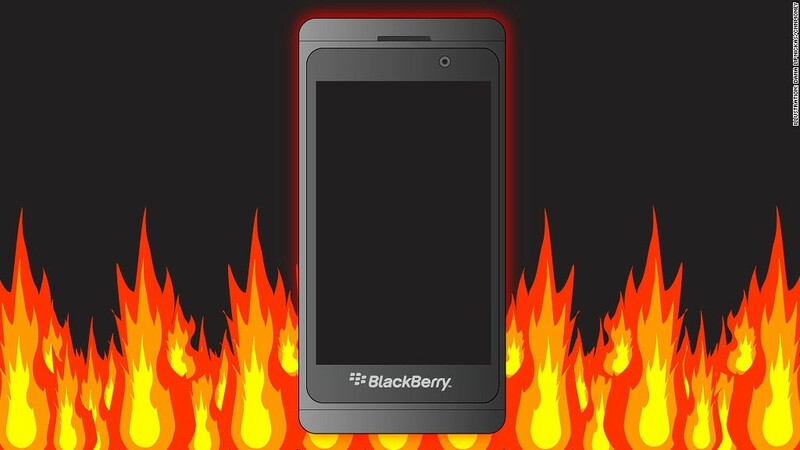 It's another black day for BlackBerry. The company officially announced dismal quarterly results, which included a $965 million quarterly loss. BlackBerry warned of the loss a week ago, and also announced that it will lay off 4,500 employees by the end of the year. Sales for the struggling smartphone maker's second fiscal quarter came in at just $1.6 billion, a 45% drop from what BlackBerry (BBRY) reported one year ago, the company said Friday. The results included a $934 million charge for unsold Z10 devices, the first phone launched on the new BlackBerry 10 operating system. BlackBerry added that a big chunk of the devices it did sell in the quarter were of older BlackBerry 7 phones. In what could be the understatement of the year, BlackBerry CEO Thorsten Heins said in a press release that the company is "disappointed" with the results. "We understand how some of the activities we are going through create uncertainty, but we remain a financially strong company with $2.6 billion in cash and no debt," Heins insisted. Shares of BlackBerry were up about 1% in early trading following the release, as investors had braced themselves after last week's preliminary announcement. But the stock is down more than 30% so far in 2013, and nearly 90% over the past five years. Friday's results could be one of the last public earnings reports from BlackBerry. On Monday, Fairfax Financial -- a Canadian insurance company that is BlackBerry's largest shareholder -- said it was considering buying BlackBerry for $4.7 billion. Cynics think Fairfax is simply trying to draw in other offers and cash out its 10% stake, but if Fairfax does make an offer, it could face a bidding war over BlackBerry's valuable patents. BlackBerry may have little left of value besides those patents. The company said last week it now plans to offer just four smartphones instead of six, and it's finally giving up on the consumer market. BlackBerry's market share has plunged in the past few years due to competition from Apple (AAPL) and companies like Samsung that make phones running on the Google (GOOG) Android operating system. Instead, BlackBerry will focus on corporate customers and "prosumers" -- professional consumers who are also increasingly opting for iPhones and Androids. BlackBerry's consumer struggles became worse with Blackberry 10, the operating system that was meant to save the company. The software's release was delayed several times -- essentially leaving BlackBerry customers with no new phones to buy. After it finally launched in January, sales of the new devices have sorely disappointed. Although BlackBerry is in bad shape, it's premature for BlackBerry diehards to worry about their service being taken away just yet. Still, some analysts think BlackBerry's userbase could fall to 0 within just two to three years as subscribers continue to leave in droves. BlackBerry will not be holding a conference call with analysts Friday to discuss its results. A spokeswoman for BlackBerry said it was due to "the Fairfax news." But analysts and investors haven't heard from BlackBerry's management beyond what's been said in recent press releases. The company didn't hold a press call after the preliminary earnings release last week. It also was silent following the announcement of Fairfax's offer.